Washington, DC, May 30, 2013 — Two-thirds of the economic development subsidy programs run by the nation’s largest cities and counties do not use the web to report which companies are receiving the tax breaks and other forms of financial assistance. Among the third of programs that do practice online transparency, most do so poorly, failing to disclose the dollar value of the subsidies. An even smaller number reveal key outcomes such as how many jobs were created. These are the central findings of a report released today by Good Jobs First, a Washington, DC-based non-profit research center on economic development accountability. The report, Show Us the Local Subsidies, is available on the Good Jobs First website at http://www.goodjobsfirst.org/localsubsidies. Among those 64 programs, only 21 (located in 16 jurisdictions) report recipient company names online. Even among those programs that do disclose, costs and benefits are mostly still missing. Only 10 of the 21 programs report the dollar value of the subsidies initially awarded, and only 6 report actual disbursements. Only 4 programs report jobs actually created, and only 9 report other outcomes such as wages. The best disclosure practices are in: Memphis/Shelby County, Tennessee; New York City; Austin, Texas; and Chicago. These jurisdictions stand out for company-specific data with costs, benefits and more. Among the 20 large localities still failing to disclose are Broward County (Florida), Charlotte, Cook County (Illinois), Dallas, Harris County (Texas), Los Angeles (both city and county), Miami-Dade County (Florida), Philadelphia, and San Francisco. Good Jobs First evaluated the 21 programs with disclosure on a scale of 0 to 100 based on their inclusion of: basic recipient information; subsidy commitments; subsidy outcomes ; and user-friendliness and accessibility. Three “bonus” categories worth up to 15 additional points include: the span of disclosure years; reporting of outcomes in addition to job creation; and the use of maps to demonstrate the location of subsidized projects. Washington, DC—American employers are organizing and winning better public transportation in many metro areas. Major employers such as universities and hospitals and coalitions of businesses help explain why state and local ballot initiatives for transit consistently win more than 70 percent of the time. Yet at the national level, there is not a unified corporate voice for transit; this has been especially evident during three recent federal debates that affected this vital public service. Instead, there are disparate voices speaking only to selected aspects of transit. Local business coalitions—united by geography—are mostly powered by companies that depend on transit, whereas national advocacy is dominated by companies that make a business selling to transit agencies. As well, there are competing priorities within public transportation circles, such capital budgets versus operating funds. Those are the key conclusions in a major study released today by Good Jobs First cataloging the many kinds of businesses that support public transit and the diverse ways they express that support. “Bosses for Buses” is believed to be the most wide-ranging study ever published on the subject; it was released at a national tele-press conference and is available at http://www.goodjobsfirst.org/bossesforbuses. The study finds most promising the formation and growth of business-led groups in specific metropolitan areas, as well as some outstanding individual large employers—often “eds and meds,” or universities and hospitals. And every day, tens of thousands of employers subsidize transit use—or facilitate the use of pre-tax income for monthly transit fare cards or commuter van pools. At the national level, many businesses that sell goods and services to transit agencies belong to the American Public Transportation Association (APTA), the voice of big-city transit agencies. The study also describes how employers participate within the Community Transportation Association of America, the Association for Commuter Transportation, and Best Workplaces for Commuters. Aspects of the 2009 federal stimulus, the belated 2012 reauthorization of the surface transportation act, and the big January 2013 federal income tax compromise all bore upon transit, yet none drew a unified corporate voice for transit service. Nor has there been corporate support for federal aid to shield transit operations from the catastrophic national wave of service cuts, fare hikes and route abandonments seen since 2008. “Third-party administrators” such as WageWorks and Edenred that manage the business of collecting pre-tax income and providing monthly transit pass cards. This obscure niche industry has recently undergone a great deal of consolidation, and with the Association for Commuter Transportation, it advocates to ensure that federal tax benefits for transit are at parity with those for parking. In sum, the study finds corporate support for transit in America to be remarkably broad and diverse, but also highly fragmented. Just when market forces and energy policy beg for a unified national employer voice for growing and improving transit service, what we find instead are disparate voices speaking only to selected transit issues. Good Jobs First has just published a report (commissioned by the UAW) showing that the subsidies provided to Nissan by state and local governments in Mississippi amount to more than $1.3 billion–far more than has been previously reported. The report can be found on our website: A Good Deal for Mississippi? Over the past decade Nissan has created thousands of manufacturing jobs in Mississippi. While the Japanese automaker has spent considerable amounts of its own money, it has also received huge amounts of financial assistance from taxpayers at the local and state levels. In this report we document the many varieties of economic development subsidies the company has been offered, among them corporate income tax credits, rebates of withholding taxes, site preparation and infrastructure grants, training grants, and property tax abatements. In all, the value of the state and local subsidies offered to the company in Mississippi is some $1.3 billion, considerably more than has been reported. The Advantage Jobs payments offered to Nissan in Mississippi are part of a controversial category of subsidies in which an employer gets a rebate of a portion of the state withholding taxes deducted from the paychecks of workers. In an April 2012 Good Jobs First report entitled Paying Taxes to the Boss, we found that the 25-year, $160 million Advantage Jobs deal granted to Nissan was the largest withholding tax subsidy ever awarded. Aside from the total amounts, the Nissan subsidies raise other issues. Mississippi legislators approved subsidies based on an overly optimistic cost-benefit analysis commissioned by the state’s development officials. Our report does not provide a full-blown alternative analysis, but it is clear to us that legislators were not given the complete picture on how much would end up going to Nissan. Although they approved a package valued at $295 million, the real cost of the tax subsidies included in the deal made it worth hundreds of millions more. According to publicly available sources, the number of jobs created at the Nissan plant in Madison County has hovered around 4,500. With Nissan eligible for an estimated at $1.3 billion in assistance over the term of the subsidy programs, Mississippi taxpayers may end up paying around $290,000 per job. Unfortunately, many of those jobs are not regular Nissan payroll positions. The figures from the state auditor show that around 20 percent are temps. In 2012, temporary employees started work at only about $12 an hour. Taxpayers have paid premium amounts for jobs that in many cases are far from premium. This, along with the fiscal difficulties we document in the community where the plant is located, suggests that the Nissan investments in Mississippi have provided a lot less net economic benefit than the company and public officials have claimed. The Atlanta Journal-Constitution has just published a devastating critique of two deal-closing funds used by Georgia to subsidize companies that are expanding or relocating to the state. Three reporters–Michael Kanell, Shannon McCaffrey and J. Scott Trubey–spent weeks at the Department of Community Affairs going over thousands of pages of documents relating to a decade of grants awarded by the Regional Economic Business Assistance (REBA) and Economic Development Growth and Expansion (EDGE) funds. The funds are allocated to local development authorities that pay for company-specific needs like new roads or sewer connections. They found that 42 percent of subsidized companies failed to deliver the full number of promised jobs, but fewer than 4 percent of awarded grants were not distributed or were clawed back as a result of that underperformance. Overall, the paper found, nine out of ten promised jobs were created, but this figure was skewed by the fact that some companies created more jobs than they promised. Some of those firms, however, later closed down or had mass layoffs. Some companies received subsidies even though their financial situations were uncertain (AJC ran a separate article analyzing giveaways to “red flag” companies). Despite the widespread underperformance, companies “can – and do – escape any penalty,” the article said. Georgia’s generous exemption policy allows companies to create only 80 percent of promised jobs before any penalty applies. Not long ago, the passing grade was 70 percent. The article comes with an infographic that includes company names, number of promised and actually created jobs, and the subsidy amounts. This is the first public disclosure of REBA recipients; EDGE recipients have been disclosed on the OneGeorgia Authority website, and that data has been incorporated in our Subsidy Tracker. In states like Georgia, where subsidy disclosure is generally non-existent or minimal, it is often only through such journalistic investigations that the public learns the truth about the state’s economic development practices. We congratulate the AJC on its great job. The privatized economic development agency was created in 2011. Governor Walker proudly proclaimed that shuttering the state’s Department of Commerce and replacing it with a privatized entity would do wonders for job creation in Wisconsin. Good Jobs First wrote a report documenting the tainted track record of privatized economic development agencies throughout the United States. We warned that these quasi-government agencies frequently lead to unaccountable, opaque organizations spending too much taxpayer dough without jobs materializing. With the Governor’s rosy jobs pledges falling short and the WEDC embroiled in scandal, it appears that the agency is destined to be yet another case study highlighting what can go wrong when a public agency becomes privatized. Millions in taxpayer money went unaccounted for. Large amounts of taxpayer money were awarded to ineligible projects. Questionable and inexplicable purchases appeared, including sports tickets and gift cards (a similar incident brought down disgraced Baltimore Mayor Sheila Dixon). The agency turned a blind eye to recipients of public subsidies, even though the law required them to report publicly on their progress. Staffers at the organization accepted some $55,000 in gifts during a six month period in 2011. The agency failed to disclose to the public known conflicts of interest from an IT consultant awarded a no-bid contract. The WEDC even went so far as to hire an auditor while that same company was negotiating a subsidy deal on behalf of a client with the agency. These findings just scratch the surface of what was uncovered. To dig into more of the juicy details, read the Audit Bureau’s full report here (summarized here). Despite the outrage by members of the legislature, the agency has embarked upon a public relations campaign to defend itself. The new CEO of the WEDC continues to claim that it has corrected its old ways and that the agency had not made “intentional violations” of state statutes. Whether the new CEO has a firm grasp on the agency is questionable: he has been on the job only a short time. All three of his predecessors have resigned amid scandal: one was found to owe back taxes to the state; another took a more lucrative job at his old company just 24 hours after accepting the WEDC position; and the first head of the agency resigned after federal investigators found mishandling of HUD money. Governor Walker has called for an emergency meeting of the WEDC to discuss the problems at the agency. 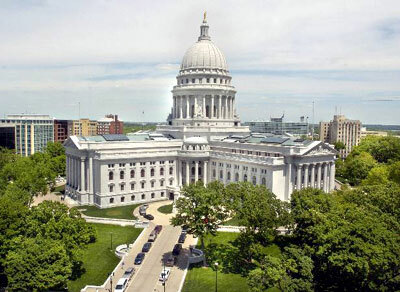 Later this week, the legislature is set to vote on the WEDC’s budget. Will Governor Walker insist that the agency take the audit seriously and implement sensible reforms like those we called for in our 2011 report? Will the Governor ignore the troubling findings altogether? Or will he disband the privatized agency and reinstate the Department of Commerce as the flagship economic development organization in Wisconsin? Washington, DC—Prominent studies that purport to measure and rank the states’ “business climates” are actually politicized grab-bags of data. They have no predictive value and should not be used to inform public policies. Those are the main conclusions of a new study published today by Good Jobs First. “Grading Places: What Do the Business Climate Rankings Really Tell Us?” is authored by Dr. Peter Fisher, an economist who has written extensively on economic development. “When we scrutinized the business climate methodologies, we found profound and elementary errors,” said Fisher. “We found effects presented as causes. We found factors that have no empirically proven relationship to economic growth. And we found scores that ignore major differences among state tax systems. The study was released today at a national tele-press conference and is available at http://www.goodjobsfirst. It examines: the Small Business and Entrepreneurship Council’s U.S. Business Policy Index; the Tax Foundation’s State Business Tax Climate Index; the American Legislative Exchange Council’s Rich States, Poor States: the ALEC-Laffer Economic Competitiveness Index; and the Beacon Hill Institute’s State Competitiveness Report. Also examined are two representative firm models: the Council on State Taxation’s Competitiveness of State and Local Business Taxes on New Investment, prepared by the accounting firm Ernst & Young, and the Tax Foundation’s Location Matters, prepared with the accounting firm KPMG. Good Jobs First is a non-profit, non-partisan resource center promoting accountability in economic development. Founded 15 years ago and headquartered in Washington, it includes Good Jobs New York.